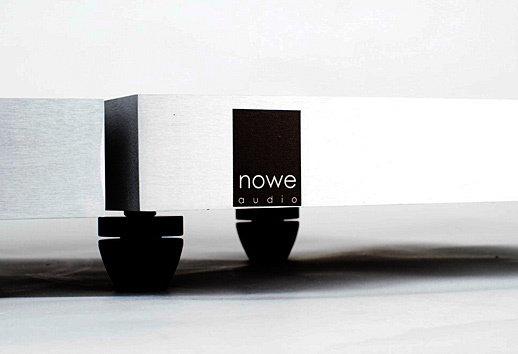 I received information about the birth of the company Nowe Audio quite unexpectedly. This is not a big deal, those things happen. 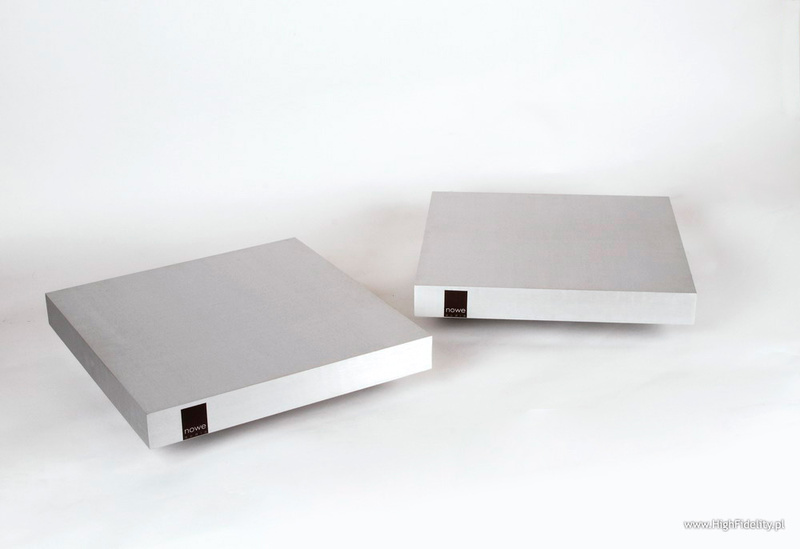 Important is the fact, that this company proposed and absolutely uncompromising amplifier, which brings the idea of “ampli-wire” to extremes, in the form of two flat, heavy as hell, made from one block of milled aluminum, monoblocks. And this was not even all – their creator turned out to be Wojtek Untershuetz, who was also responsible for the loudspeakers Acuhorn, from which we tested the model Rosso Superiore 175; you can also find an interview with Ms. Alicja (privately the wife) and Mr. Wojciech HERE. From that perspective you can see, that the idea behind the tested amplifiers is not new, but a consequence of earlier research and putting emphasis on simplicity in the most worked our form. „mono3.5 [this is the way the company consistently uses – editors note] does have nothing in common with previously presented constructions. 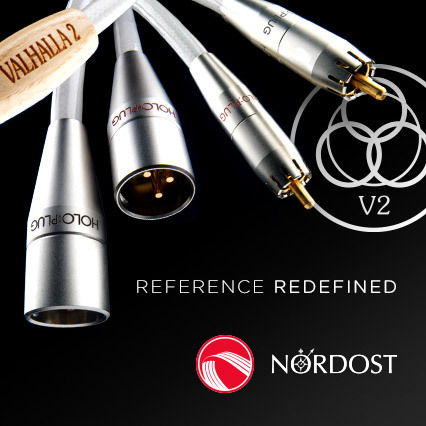 I chose one new element for it, not used by anybody in audio, from the newest technologies available in solid state. This is a MOSFET – not a tube, because tube technology is inductive and imprecise. The amplifier is switched on with a red, backlit power switch. 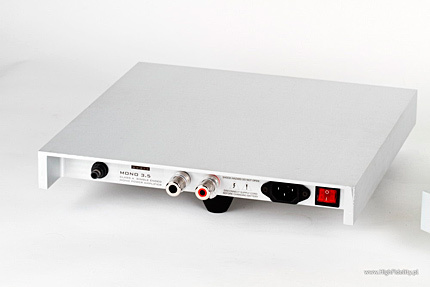 During plugging and unplugging the audio signal input and loudspeaker output, the level from the preamplifier may not exceed 20V peak, as it will damage the MOSFET. For full power it needs from 4.4V for 2Ω speakers to a maximum of 6Vpeak for 8Ω. The cabinet acts as a heat sink, so nothing can be put on top of the amplifier: at 20°C room temperature the top cover will have about 40°C, in a sunny spot with 40°C it will be very hot – 65°C (the temperatures were measured with a thermo camera on Politechnika Gdańska). I will not write more about that, but I am pretty sure, you have not seen anything like that before. FIM Super Sound! II, First Impression Music, FIM XR24 067, XRCD24; review HERE. Wes Montgomery, Just Walking, Verve/Universal Music Japan, UCCV-9355, SHM-CD; review HERE. Already during the first listening it became clear, that the sensitivity of the monoblocks is very low, and without a high gain preamplifier (one with a high output voltage) you will not get any sound out of them. But this could have been expected, having only one (!) transistor inside the sound path, and Mr. Wojciech did not make a secret out of it. With the Harpia Dobermann (86dB) and the preamplifier Ayon Polaris II I had to put the volume knob almost at maximum. I do not have problems with that, but it could be heard, that the amplifier is begging for a higher efficiency of the loudspeakers or a different preamplifier. And this is really interesting, because the unit is specified at 10W (at 8Ω), and the amplifier I listened to just a day before, the ATM-300 from the Japanese specialist Air Tight, using 300B tubes (HERE) with 8W rated output power, sounded much, much louder. Here you can see the basic difference between the tube and transistor – the first ones go into clipping softly, so they will sound subjectively louder, albeit with higher distortion. And although the amplifiers waited for different speakers, I could already tell something about them. The sound was incredibly natural. Not a tube sound, not a transistor sound, but just “its own” sound. Slightly soft, but not due to softening of the edges, but due to the lack of stinging sharpness. Everything was well balanced in that sound, maybe except the light bass. But this had to wait for other loudspeakers before I could make any judgement. The treble was incredibly resolving. A bit in the direction of 300B tubes. The sound with the Dobermann was not as palpable as with the ATM-300, not even mentioning the Jota Sentry Art Audio. But this differentiation, this ability to show microdynamics! Those were outstanding even now! The longer I listened to this product, coming from the city of Gdansk, the more I realized what I am hearing. Because the case with critical listening sessions is, that they cannot be done “cold”. At least this is what comes from my experience. To evaluate the sound well, we have to change into a “participant”, come into the sound, confront it with what we remember, allow it for a while to take control of us, and come back to the “observer” status from the other side. Music is emotion, and listening to it is also very emotional. When nothing moves us, then it is just an intellectual game, and it makes no sense, it is better to go out for a beer – it will be of better use. Consuming this transfer must rely on its “translation” from its language to our language, our way of evaluating things, our sensitivity. This is the reason, that there are as many readouts of musical pieces as there are listeners, this is why it is so beautiful, because it is infinite area of art. Of course we cannot forget about analysis, because it gives some boundaries to everything, proposes some “solid” borderlines we can refer to – in a positive, but also a negative way. But analysis can give any effects only if we have some personal feelings to the tested device. I believe, that a “non-aligned observational entity” is a harmful invention, a reverie of structuralists, maybe correct from an ideological side, but impossible to apply. In case of the monoblocks mono3.5 not everything I see now, was clear was clear from the beginning. I had to “work” with that sound, confront it with the “models” I carry inside. At the end of the fourth month of listening I finally knew – at least I think so – the what and where. Sonus Faber Amati Homage ..... 92dB, minimum 2.2Ohm. And that is true – I found loudspeakers with impedance lower than my Dobermann. At a medium volume level, in my room, which has the main part of around 25m2, the amplifiers handled loudspeakers with impedance lower than usual well, namely the Chario Academy Sonnet. Their manufacturer quotes the efficiency at 90dB (4Ω), but I have the idea, that it is lower, more like 88dB. And yet those speakers sounded fabulous with those amplifiers. Talking about a “tool” for the recording studio, I did not think about harsh processing, like with a hammer and a saw, but rather fine tuning, like laparoscopy surgery. The quality of the treble and midrange is truly reference, and it can only be compared to a few other amplifiers I know, the monoblocks Ancient Audio 300B and the hybrid power amplifier Tenor Audio 175S, which I am using for some time.